Lux meters that are capable of measuring high-speed light intensity fluctuations are hard to find. This article describes a DIY lux meter that has a linear relation between the light intensity and output voltage and has a -3 dB frequency range from DC to 350 kHz. The spectral sensitivity is broadly similar to the human eye. Fig. 2: Transfer characteristics of a BPW21 photodiode. For this lux meter a photodiode is used as the light sensor. This is because the output current of photodiodes is proportional to the light intensity and it has a fast response to light changes. The relation between the light intensity Ev and the photocurrent Ip can be seen in figure 2. 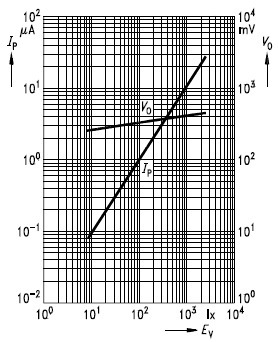 Also the non-linear open-circuit voltage Vo transfer characteristic is plotted in this graph. Fig. 3: Simplified model of a photodiode. To explain the behavior of a photodiode a simplified model is shown in figure 3. S is a current source who's output current Ip is proportional to the photon flow Ev. The photocurrent Ip will charge the parasitic capacity C that causes the rising of the output voltage Vo. Because there is now also a voltage across the diode D, a current ID flows through the diode, which limits the rising of the output voltage. If the load resistor Rb is infinite, all the photocurrent Ip will flow through the diode and the output voltage will be fully dictated by the diode characteristic. If the load resistor has a certain value, the photocurrent Ip will be distributed over the load resistor Io and diode ID. However the photocurrent has a linear relationship with the light intensity, it's obvious that neither the output voltage as well as the output current will be proportional due to the non-linear diode characteristic. Fig. 4: Model photodiode in current mode. In order to prevent the diode from disturbing the transfer characteristic, no current may flow through the diode D. This can only be done when there is no voltage across the diode. In order to achieve this, the photodiode must be shorted out as shown in figure 4. Another advantage of shorting out the diode is that the capacitor charging current IC also is eliminated. In an open circuit mode the capacitor has to be (dis)charged every time the light intensity changes. This has a big negative influence on the rise and fall times. A measurement showed that the frequency range dropped to 4 kHz when the terminating impedance was 10 MΩ. As explained, the photodiode must be shorted out to get a linear transfer characteristic and a speedy response to light intensity changes. One way to keep the diode voltage low is by using a shunt resistor. But it has the disadvantage that it requires a very low input offset amplifier with a low drift. A better way is using a transimpedance amplifier as shown in figure 5. This is an active current to voltage converter with a very low input impedance. Note that the current has a negative sign because it's an inverting circuit. The current arrows in figure 5 are already pointing in the negative direction. Fig. 6: Circuit diagram of the lux meter. The principal circuit of figure 5 is clearly recognizable in the final circuit shown in figure 6. The photodiode D1 is positioned in a reverse manner to get a positive readout after the inverting transimpedance amplifier. The value of the feedback resistor R1 gives the circuit a sensitivity of approximately 500 μV/Lux and is a compromise between speed and noise. The capacitor C1 placed in parallel with R1 is necessarily for the stability of the amplifier. The components R2,3 and C2...5 make an artificial ground at half the supply voltage. The photodiode chosen for this lux meter is the BPW21. This type has a relative spectral sensitivity roughly corresponding to the human eye. The BPW21 has a spectral sensitivity of 10 nA/Lx (Osram), but the spread is rather large: Telefunken specifies the sensitivity between 4.4 and 10 nA/Lx with a typical value of 7 nA/Lx. So the lux meter has a rather large sensitivity uncertainty. To minimize the error the circuit needs a calibration against a luxmeter with known specifications. Fig. 7: Relative spectral sensitivity of the BPW21 photodiode. The OP37 is a precision, low noise and high-speed opamp with a frequency bandwidth of 63 MHz. This high bandwidth is necessarily to get enough amplification at higher frequencies. At 200 kHz the opamp has an open loop bandwidth of 50 dB (x 316). With this figure the worst case voltage across the photodiode can be calculated. At a light intensity of 5000 Lx the photocurrent is 50 μA. The voltage across R1 is than (50 μA * 50 kΩ =) 2500 mV. The input voltage difference and therefore the voltage across the photodiode is (2500 mV / 316 =) 7.9 mV. This is low enough to keep the photodiode in a linear operation. The input offset current of 12 nA and the input bias-current of ±15 nA introduces an extra uncertainty of about 1.35 mV or 2.7 Lx maximum. The measured output noise is 650 μVRMS that corresponds to a RMS noise level of 1.3 lux. Fig. 8: Lux meter wave-shape check with a 50 kHz light source. The resistor R1 defines the amplification and therefore the sensitivity. If another sensitivity is needed than this can be done by changing its value. By making R1 higher: the amplification will increase but this is at the expense of the bandwidth. If the value for R1 is increased, the value for C1 must be decreased in approximately the same inversely proportional ratio. Due to the tolerances of the used components it's recommendable to fine-tune the value of C1 to get an optimal frequency response. Figure 8 shows the output signal when the sensor is light by an LED that is connected to a function generator. The current though the LED switches between 7.9 and 15.4 mA. Despite of the noise the sharp transitions from the edges to the level states are visible. If the value of C1 is to high the transitions become more rounded. If the capacitor is to small the edges will overshoot or worse the circuit will oscillate. Following a few examples that needs a high-speed lux meter. Fig. 9: Camera flash when the camera is pointed to a light surface. Fig. 10: When the camera is pointed to a dark surface in a darker area the width of the second flash becomes wider. The use of a fast lux meter can reveal information on the behavior of the flash that cameras produce. For this measurement a Panasonic DMC-TZ10 is used. When a picture is taken the camera gives a double flash. These two flashes are visible as two spikes on the upper trace of figure 9. The time between these two flashes is approximately 140 ms. The lower trace shows each flash in detail. The oscilloscope screen dump in figure 10 shows another flash but now taken when the camera is pointed to a dark surface in a darker area. Observe that the first flash in both measurements have the same shape and width. The second flash taken in darker conditions has a much larger duration than the flash taken in lighter conditions. Presumably the camera uses the first flash to measure how the conditions are and uses this information to adjust the power of the second flash for a sufficient exposure. Fig. 11: 90 kHz light intensity fluctuations of a compact fluorescent lamp due to its switching frequency. One of the first measurements with the lux meter showed the not surprisingly 100 Hz light fluctuations coming from the lamp in the room. This is due to the 50 Hz mains frequency. Except this, there was also a significant "noise" present. When zoomed in this "noise" turned out to be a 90 kHz light intensity fluctuation as to be seen in figure 11. This was no electronic interference because the amplitude increased when then light was more concentrated on the sensor with a magnifier glass. This light variation is obvious caused by the electronic switching circuit that the lamp contains.